At this point, I'm pretty positive that stripes of all sorts are going to be my thing this fall/winter season. It's my easy way of adding "prints." Stripes are such an easy way to stay in your color palette while adding some visual interest. Not to mention, stripes that run vertically usually have a slimming and elongating effect, so you know I'm already down! Blue is my favorite color, so why not let it take over my entire look? I threw in a go-to pair of distressed jeans and velvet boots. Get full details on where to find each of these items and more on the Lan Yu show below! mix. I know most of you have probably shopped with them at one point or another, but if you haven't experienced the denim they sell, please get on that! Their denim is super high quality and they carry awesome brands. One of my favorites is Lovers & Friends when I'm looking for good jeans. They have a perfect thickness to them so I don't feel like they are going to stretch out or become unflattering over time. These particular ones in the photos sit at the perfect spot on my hips and the busted knees give them that edgy yet relaxed look. 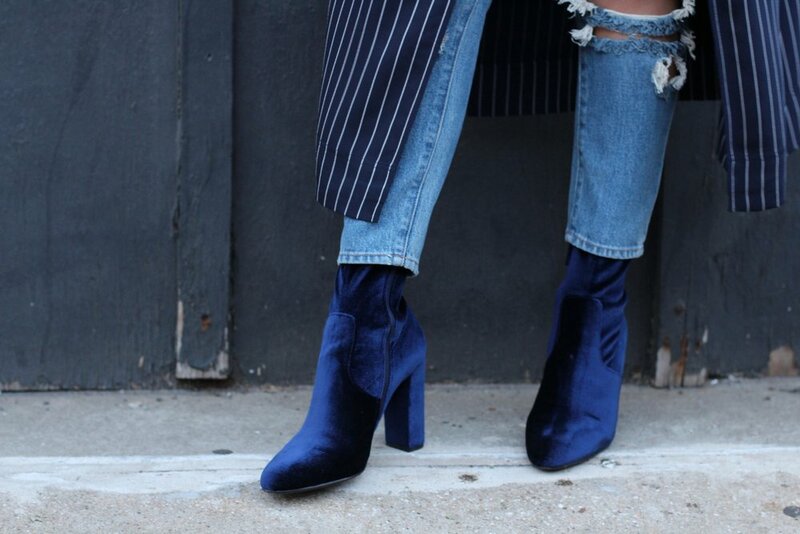 I'm obsessed with velvet and have been ever since they came bak on the scene last fall! I turned to Steve Madden to give my new found trend crush a try without breaking the bank and they just confirmed my love for velvet. They fit like sock boots, which made them fit perfectly under the ankle of my jeans. This show was full of airy and whimsical pieces that moved effortlessly with the models as the walked the runway! I loved the shimmery materials and asymmetrical hem lines. there were a few colors in there that reallystood out to me. I loved the blue, almost turquoise velvet jumpsuit and green two piece set (both shown in the photos. Pieces like the shimmery silver asymmetrical dress and ballgown were mesmerizing!